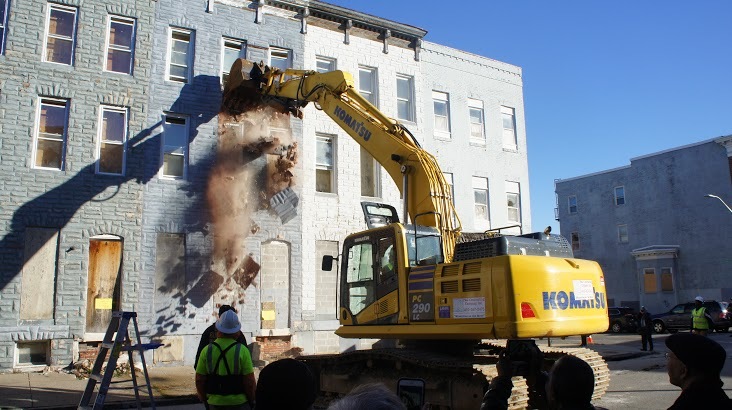 The first demolition in the city-state partnership kicked off in the 1000 block of N. Stricker Street in the Sandtown-Winchester neighborhood. ANNAPOLIS, MD – Governor Larry Hogan and Mayor Stephanie Rawlings-Blake today announced a multi-year, multi-hundred-million dollar initiative to address blight in Baltimore, declaring that the joint city-state partnership will bring significant resources to demolish thousands of vacant buildings and replace them with green space and a stronger foundation for redevelopment and reinvestment in the city. The governor and the mayor kicked off Project C.O.R.E, or Creating Opportunities for Renewal and Enterprise, in west Baltimore’s Sandtown-Winchester neighborhood, where the entire 1000 block of N. Stricker Street is slated for demolition. Under the terms of the four-year partnership, the State of Maryland and the City of Baltimore will focus on the transformation of blighted city blocks. The Maryland Stadium Authority is the project manager responsible for overseeing the demolition of vacant structures jointly identified by Baltimore City and state authorities. Total estimated funding over the next four years for the demolition portion of the project includes $75 million from the state and in-kind administrative services from the City of Baltimore, equivalent to $1 for every $4 allocated by the state. In the first year of the program, the state estimates that approximately twenty city blocks can be completely cleared of blight. In subsequent years, the Maryland Department of Housing and Community Development along with the Baltimore City Department of Housing and Community Development will establish demolition targets annually, with a goal of demolishing as many full blocks of blight as possible over the term of the project. Once demolition is completed on a city block, empty lots will be replaced with green space and assessed for their potential to be redeveloped in the future. The first demolition in the city-state partnership will be in the 1000 block of N. Stricker Street in the Sandtown-Winchester neighborhood. 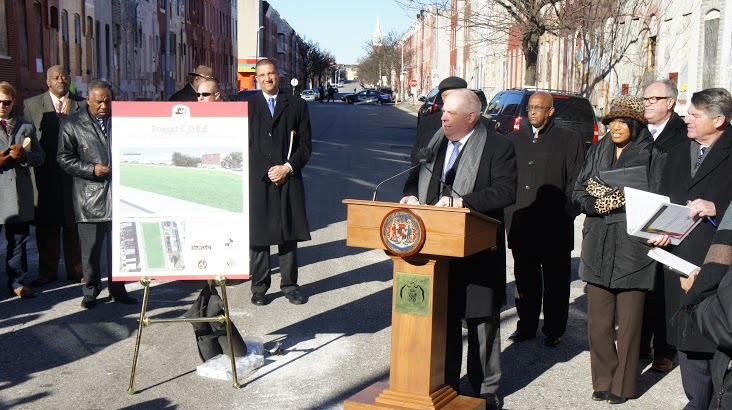 The elimination of blighted portions of the city will be supported by more than $600 million in financing opportunities from the Maryland Department of Housing and Community Development, including more than $150 million in fiscal year 2016 alone. The state’s commitment will encourage private sector developers to revitalize Baltimore’s neighborhoods through housing and other investments that will attract families and support economic growth. Financing for quality development projects will be made over the next four years through a range of innovative programs and partnerships, including the Rental Assistance Demonstration program and the issuance of potentially $200 million in revenue bonds. Maryland Stadium Authority Chairman Thomas Kelso said the authority has expertise managing large-scale projects such as this. The Maryland Stadium Authority, an independent agency, was created in 1986 for the purpose of building facilities that would attract a new National Football League team to Baltimore and retain the Major League Baseball Orioles team in downtown Baltimore. The authority has since been involved with projects involving historic preservation, adaptive reuse, community redevelopment, and economic opportunity throughout the State of Maryland.